This tutorial on Basic Online Blackjack strategy assumes that you have read the introduction to blackjack article which teaches you the game in just three minutes. Now for the fun part, how to use your wit to squeeze out the most profitable wins at the tables. Blackjack, not only the online version, is all about the magic number 21. Online Blackjack strategy is about judging how likely you are to reach 21 based on the cards that are already placed on the table. There’s some simple arithmetic involved and it will get easier to calculate as you go along so don’t get your knickers in a knot just yet. Read, understand and then apply. Also remember the safest place to learn strategy without any pressure is by trying it out online. No more deliberation. Let’s get straight into it, shall we? First and foremost, as most guides will tell you, unless you are a seasoned professional or are very good at counting cards, never take insurance. Insurance is technically just a side bet on whether the dealer has a 10-value card or the one that pays out 2 to 1. Always split Aces and 8’s. Never split 10-, 5- or 4-value cards. 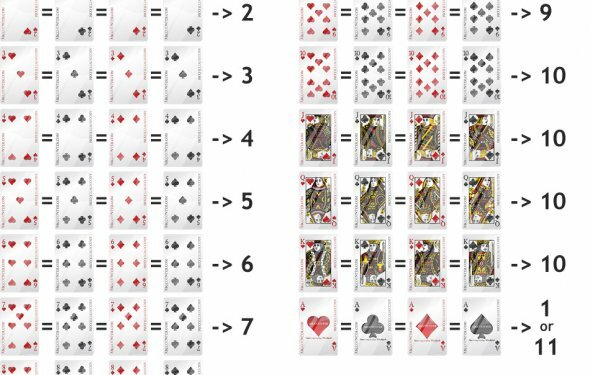 Because 10s, Jacks, Queens and Kings are all 10-value cards, there are more 10-value cards than any other cards in the deck. By assuming the dealer’s next card will be a 10-value card, a player can divide the pack into two – cards that will likely bust and cards that will likely win. In accordance with this school of thought, if the dealer has a 2, 3, 4, 5, or 6, they are likely to bust. In this instance, players should aim to avoid busting themselves and not take any big risks. Alternatively, if the dealer has a 7 or higher, they are more likely to get a card total of 18-21. In this instance, players with a card total of less than 18 could be more aggressive but need to remember that they run the risk of going bust. You start of with 2 cards and then if you haven't got Blackjack (Blackjack consists of two cards One of the cards must be an ace and the other card can be any of the following: 10 , Jack, Queen, or King). you will be offered more cards.